Lyram leaned on the window casement, scouring the bustling courtyard of the royal palace of Ahlleyn below. Servants in the black and purple livery of the clan Gaylbrath strode confidently about their tasks, and his gaze skipped over them, looking for someone obviously out of place—looking for the crow amongst the sparrows. From this high, picking individual faces out of the crowd was impossible, but that didn’t stop him searching. He didn’t need a face to find the person he sought. Despite his failure to note anyone out of place, he knew there was at least one person in the palace who shouldn’t be there. He could feel it in his bones. The Duchess of Kinrothen narrowed pale-blue eyes at him. She stood in the centre of his sitting room, an inner sanctum furnished by his late wife, and a place of solitude and reflection where he’d usually not permit the duchess. But, short of his bedchamber, this was the only room in his suite with a window. He needed to see the courtyard, and she’d insisted on speaking with him. Lyram swallowed a long-suffering sigh. Narrawen, standing with her head cocked and one hand on a hip, was a fine figure of a woman, but she was also a schemer. Her kirtle, though made of expensive linen, was woven in the red, yellow and green tartan of her clan; she took every opportunity to wear it, as though reminding everyone she was their clan leader. Though women were accepted as equals in Ahlleyn, a woman heading a large warrior clan could experience certain… troublesome elements, and she carried a bow slung over her shoulder. A woman who would lead warriors must be a warrior, and she had the temperament to match the flaming red hair tumbling down her shoulders in unruly curls. Everything she did was calculated and planned, and there was no way he’d be sharing what was on his mind. “It’s nothing to trouble yourself over,” he said. “Oh, it would be no trouble to take a burden from your shoulders.” She stepped forward, closing the distance between them to place a hand on his arm. The heady aroma of eastern tuberose assaulted his nostrils, rich and sensual. She was tall, the top of her head on a level with his nose, and her breath tickled his clean-shaven chin. Her gaze held the resolute intensity of a woman accustomed to getting her way, sooner or later. She was beautiful, and in a way that went beyond her face and figure: she was fierce, determined, and intelligent. But when he looked at her, he saw only Ellaeva. Her brow pinched, as if reading something in his face, and he smoothed his expression. “You’ve been too long a widower,” she said. She leaned closer, until only inches separated their faces. The heady smell of her perfume was almost intoxicating. The door burst open, thumping against the wall. Narrawen jumped back, her bow clattering against the side table. A faint blush stained her cheeks. Lyram’s pulse quickened. This was it, the moment he’d been waiting for. Lyram opened his mouth to countermand the order—though she outranked him, how dare she presume to order his aide-de-camp? Narrawen grew rigid, and Lyram suppressed a grin. “No, sir—” Everard blinked, jerking aside as though pinched, and Ellaeva stepped into the room. The shock of seeing her thrilled through him, like the mixed pleasure of an unexpectedly warm spring day, tainted by fording a stream running with snowmelt. Though he’d felt her jump suddenly from the far east to well within Ahlleyn borders several days ago, though he’d felt her drawing nearer by the day, he hadn’t realised she was here, outside the room. And no amount of time could have prepared him for this moment. Their gazes locked. Her black eyes were flat and cold. In his head, the sense of her abruptly clenched into the hard glass ball that said she was trying to control or hide her feelings. That connection was the unintended legacy of his resurrection at her hand, but she’d grown better at controlling it. Then her gaze flickered to Narrawen, standing so close alongside him, and the glass ball shattered into a thousand shards with an impact so visceral he gasped and sat down. The chill in the air deepened. 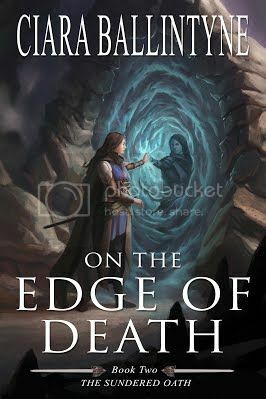 Ciara Ballintyne grew up on a steady diet of adult epic fantasy from the age of nine, leaving her with a rather confused outlook on life – she believes the good guys should always win, but knows they often don’t. She is an oxymoron; an idealistic cynic. Her debut work is Confronting the Demon, and In the Company of the Dead is her first book to be published with Evolved Publishing. She holds degrees in law and accounting, and is a practising financial services lawyer. In her spare time, she speculates about taking over the world.